I really like the grouping of the Brentford players at this corner – having the players so deep in the box means the goalkeeper has to either sacrifice not knowing where the Brentford players are – or or keep glancing round and potentially losing vital seconds watching the ball come in. Annoyingly the footage is focused on the corner taker so we can’t really see what happens in the box, but as pointed in several of the other parts of the Vio series – Vio loves a runner attacking the back post from deep and it looks like the same was employed here. The movement here is fantastic as the players towards the edge of the penalty area swerve and slalom between running towards the front or the back post. This keeps their markers guessing and causes confusion in the box. The Brentford players congregate in an offside position before sprinting back onside into their positions, it’s hard to tell from the angle the game was filmed whether the goalkeeper’s vision was blocked by some of the Brentford players, but it would surprise me if there were no Vio screen. Again the footage concentrates on the corner taker rather than what’s happening in the box (why do camera operators do this?!) so it’s near impossible to tell what happened with player runs, but Brentford’s header came for the area I always try to get my teams to attack – the middle of the 6-yard box is the most dangerous area to attack. Appalling camera work again, but again shows the advantage in Vios routines. Vio always has players attacking the 6-yard box from multiple directions and timings, this ensures that in case of a second ball (such as seen here) – there’s players on hand to put the ball home if needed. The free kick is whipped in, the player running in front of the goalkeeper distracts him for just a second and the ball somehow finds the way into the net without touching anyone. Again the footage is terrible (why Football League why?) 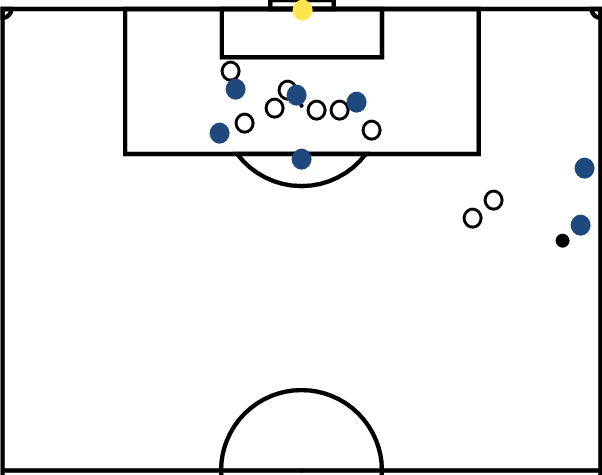 so we can’t see the movement of the players, but the ball is headed from the area I pointed out earlier as the most effective area to attack – the middle of the 6-yard box. The players crowd the 6 yard box before all beginning their jinxing runs with some players acting as blockers – stopping the runs of defenders allowing their teammates to attack space unopposed. A superbly worked corner and well deserving of a goal. We see a similar tactic that was deployed for Brentford. A free-kick from a deep position had a couple of Leeds players offside (and therefore unmarked). Just before the ball is played in the players run back onside and begin their run. The ball is superb and one of the 2 players playing with the offside trap manages to score. Gianni Vio has revolutionised the art of taking set-pieces and the number of goals he’s been responsible for is simply staggering, so many of his set-pieces when you break them down are pure genius – and some of the concepts so simple (such as the Vio screen) that it’s staggering that we haven’t seen widespread adoption of them yet. Vio’s career is something I’m hoping to emulate and i’ve learnt plenty from this series and will hopefully be taking many aspects into my career down the line. I hope you’ve learnt as much as me!